Fans of Janet Evanovich's Stephanie Plum series will enjoy shaking up the Philadelphia Main Line. To learn more, check out the Killer WASPs Facebook page:https://www.facebook.com/killerWASPsseries. 2 eBooks up for grabs! **No compensation was received for posting. This site is not responsible for giveaway or prize shipment. Opinions are owned by this site. I LOVE the Stephanie Plum series!!! I would love to read something comparative!!! I'm very intrigued by the cover of the book! I love Janet's Plum series and this sounds like a great read. 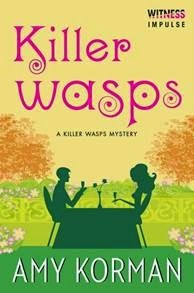 I am a fan of cozy mysteries. As soon as I saw the title, it put a smile on my face. Have a nice weekend. I admit, I judge a book by its cover & this cover is amazing!! !